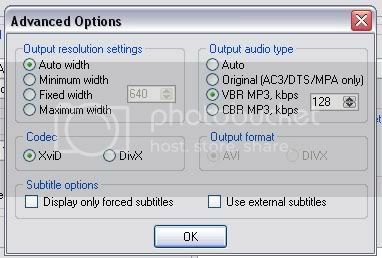 Ripping a DVD to xvid or divx avi is really quite easy, if you have the right tools. You’ll first need to download DVD decrypter and auto gordian knot (autogk). 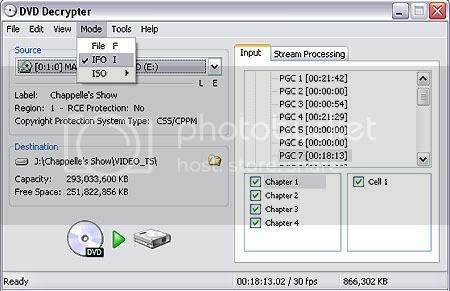 DVD decrypter allows you to rip the raw DVD video and audio data off of your disk drive, decrypt the CSS protection, and finally remove any other protection schemes, such as Macrovision. AutoGK is a package of codecs and a GUI interface that will take the raw DVD data through an AV processing pipeline to produce a single windows video file. The whole ripping process shouldn’t take more than 5 minutes. [04/18/2008 9:07:27 AM] Job started. [04/18/2008 9:07:27 AM] Started encoding. [04/18/2008 9:07:27 AM] Demuxing and indexing. [04/18/2008 9:08:30 AM] Found NTSC source. [04/18/2008 9:08:30 AM] Analyzing source. [04/18/2008 10:28:40 AM] Source is considered to be hybrid (mostly NTSC). [04/18/2008 10:28:40 AM] Looking for optimal hybrid thresholds. [04/18/2008 10:28:45 AM] Decoding audio. [04/18/2008 10:29:16 AM] Normalizing audio. [04/18/2008 10:29:28 AM] Encoding audio. [04/18/2008 10:31:57 AM] Running compressibility test. [04/18/2008 10:35:01 AM] Speed was: 12.61 fps. [04/18/2008 10:35:01 AM] Running first pass. [04/18/2008 11:02:56 AM] Speed was: 23.10 fps. [04/18/2008 11:02:56 AM] Running second pass. [04/18/2008 11:42:43 AM] Speed was: 16.22 fps. You’re done. Delete all the non .avi files and enjoy the fruits of your ripping. all the chapters? And is it a movie DVD or did I do something wrong? Axxo use AutoGK but aXXo use for DvDrip-aXXo something else. I have so many doubts if Mr.aXXo really uses these 2 tools for ripping 3-4gb DVD to 700mb avi files. But if these work than thanks for this informative article. Yeah, I tried many converters but only use AutoGK n Vidsplitter that let us to select size of 700mb for output files. So now I shall try with DVD Decrypter as the above article. In step 2, the encoding process, you wrote to choose the VOB file as the input. Didn’t you mean the IFO file? I just chose the IFO and ripped S01E05 of Dexter and it worked perfectly. I think you meant IFO, am I wrong? This would work with the DvD decrypter if it would update. I had a problem with newer DvD’s and switched to DvDFab. You ctuallyu need to select the .ifo file, not the .vob. search “Rip dvds like axxo” in google and click the first link.